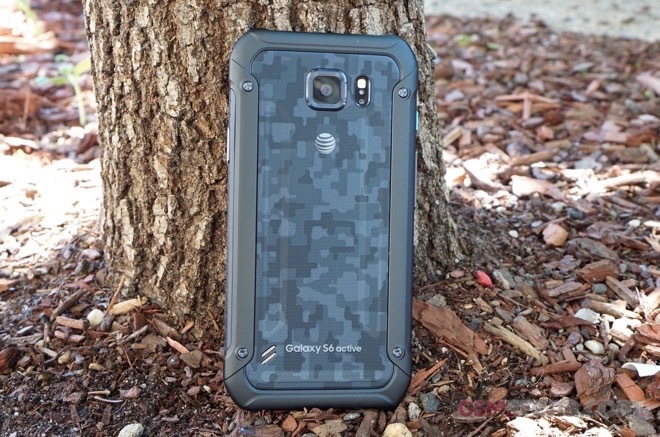 Samsung Galaxy S6 Active features a massive 3,500mAh battery. The rest of the rugged device’s internals are identical to those found in the regular Samsung Galaxy S6, so we were quite curious to put it through our battery test. The 2,550mAh battery of the SM-G920 was sufficient enough to propel it to a stellar endurance rating of 73 hours. With roughly 40% more battery capacity than its non-rugged sibling, Samsung Galaxy S6 Active commands seriously high expectations. Read on to find out if the device delivers! 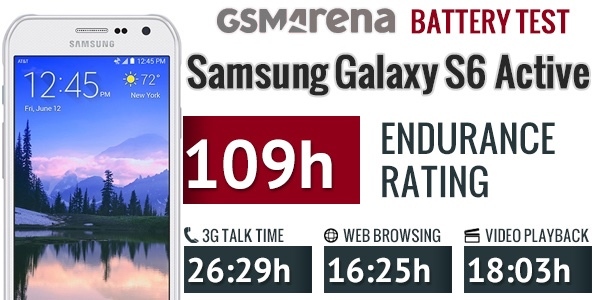 With 26 hours and 29 minutes of 3G talk time, Samsung Galaxy S6 Active started off our battery test on a high note. The device’s result is considerably higher than the 19 hours and 48 minutes posted by the regular Samsung Galaxy S6, and one of the best performances we’ve witnessed to date. The impressive performance of the smartphone continued in the web browsing section of out test. With 16 hours and 25 minutes of endurance, the SM-G890 once again produced one of the best results on the board. it also handily beat the 11 hours of web browsing posted by the regular Galaxy S6. Battery performance of the device during video playback has been stellar too. Samsung Galaxy S6 Active lasted for a tad above 18 hours before calling it quits. This is yet again a top notch score that’s among the best we’ve witnessed. Quality outings in all of our battery test sections naturally resulted in the truly impressive endurance rating for Samsung Galaxy S6 Active. With a score of 109 hours, the Korean giant’s rugged flagship beat Nokia Lumia 1520 for the top spot in our battery test rankings. The Windows Phone phablet has been ruling for a while now, so the S6 Active surely deserves props for toppling it without skimping on hardware features. Even more impressively, despite its massive battery, the SM-G890 still totes a body that’s only 8.6mm thick. The extra 40% of battery capacity for Samsung Galaxy S6 Active over the regular model resulted in roughly identical advantage in terms of battery endurance. We certainly believe that the target audience of the rugged flagship will appreciate the extra endurance the device offers. So, there you have it! Samsung Galaxy S6 Active is our new battery test champion. Here’s hoping that the smartphone will soon become available to more markets globally – it surely deserves the attention.